In the previous blog entry, we mentioned that Michael Steele, the chairman of the Republican National Committee, expressed his desire to see more people of color represented within the Republican Party. Steele made this statement at a meeting of Florida Republicans. At the same meeting, Jim Greer, Florida’s party chairman, said that the party would focus on using technology to invigorate younger Republicans. The folowing charts help to explain why Republicans might be concerned about ethnic and age diversity within their party. These are from the Young Voters in the 2008 Presidential Election Fact Sheet, which was prepared by CIRCLE, the Center for Information and Research on Civic Learning and Engagement at Tufts University. This first chart is not elegant aesthetically, but it makes a powerful point about the ethnic make-up of voters in the November elections. The chart shows the ethnicity of the electorate, broken-out by different age groups. What we’re seeing is that the under-30 population has become more ethnically diverse than older age groups. Whites are a smaller portion of the electorate, while the percentage of African Americans and Hispanics is growing. I’ve posted several stories lately on some of the negative reaction to Barack Obama’s election to president, from both here in the US and abroad. WASHINGTON — Barack Obama’s election has inspired a wave of optimism about the future of race relations in the United States, according to a USA TODAY/Gallup Poll taken the day after the first African American won the White House. Confidence that the nation will resolve its racial problems rose to a historic level. Two-thirds of Americans predict that relations between blacks and whites “will eventually be worked out” in the United States, by far the highest number since Gallup first asked the question in the midst of the civil rights struggle in 1963. Optimism jumped most among blacks. Five months ago, half of African Americans predicted the nation eventually would solve its racial problems. Now, two-thirds do. I can personally say that I was pleasantly surprised by the election results. Obama got more of the white vote than Kerry did in 2004. He got just under 50% of the white outside the South and southern border states. I honestly didn’t see it coming. It’s not all good, but there’s more reason for optimism than cynicism. Here are my own election winners and losers, plus some “too early to tell” entries. Barack Obama. Duh. This Hawaiian born and bred biracial intellectual with minimal experience has become perhaps the most unique and remarkable politician in American history. Now we’ll see if he can fix the mess that George Bush and congressional Republicans have made of this country. Michelle Obama. The Right tried to demonize her into being an anti-white angry black woman who does terrorist fist bumps with her pals-with-terrorists husband. But like her husband, the more you saw of her, the better you felt about her. I think she benefitted from not being a silent trophy wife; her speech at the Democratic National Convention and numerous media appearances showed her to be articulate, smart, and personable. I have no doubt that America is embracing her as the new First Lady. Democrats in the Southeast: Who would have predicted even two years ago that a black Democratic presidential candidate would win in Virginia, North Carolina, and Florida? And how about the fact that Virginia and North Carolina both sent Democrats to the US Senate this year? The bottom line is, the southeast has become a new battleground for the parties, after being owned by Republicans the prior two elections. And they could have more success there in the future, if they play their cards right. Democrats in the Industrial Midwest: The last two northern Democrats to be nominated as presidential candidates were both from Massachusetts. They both lost. This year a candidate from the Midwest gave it a try, and found success. Observers are saying that the proximity of red states like Iowa and Indiana to Obama’s “home” state of Illinois was a factor in his victories there. I bet that a lot of Democrats from the Midwest are looking at themselves in the mirror and thinking, maybe I’m next. At least, Obama’s victory disturbs the conventional wisdom that only a southern Democrat has a chance of winning a presidential election. Organized Labor: Make no mistake, labor put a lot of money and manpower into this election. The Democrats’ success in Pennsylvania and other Great Lakes states is owed in part to their efforts. Now we’ll see what organized labor wants, and how much they can get from Obama and the Congress. A bail-out for the auto industry seems first on the list. Internet Based Campaigning: The Obama campaign has become a legend in its own time thanks to its masterful use of the Internet to organize, communicate, and raise money. By the next presidential cycle, everybody will be doing it-or at least, they’ll try. Cornell Belcher and Leah Daughtry: You probably don’t know these two black technocrats who work for the Democratic Party, but you should. In an earlier post, I said that Barack Obama might have gotten half of the white vote OUTSIDE the South. Based on my review of exit poll information, Obama missed the 50% mark by a whisker, getting 49.7% of the white vote outside the South-versus just 30.2% of the white vote in the South. Nationwide, Obama got 43% of the white vote. By contrast, John Kerry got 41% of the white vote when he ran for president in 2004. Thanks to some great work at the site Gene Expression in the post The Great White Sort, we have consolidated information from exit polls about the white vote in the presidential election. I used that to prepare two tables about the white vote for Obama. TABLE 1, which is below, shows the white vote outside the South; TABLE 2 shows the white southern vote. Note the contrasts in the voting numbers. • Obama got the highest percentage of white votes in his native state of Hawaii. He got a whopping 70% of the white vote there. • Obama got 50% or more of the white vote in the mega-states of California (52% of the white vote), New York (52%), and Illinois (51%). • Obama’s worst performances were in Utah (31%), Alaska (32%), and Wyoming (32%). In Arizona, Obama got 40% of the white vote. • Several states with small minority populations, all in New England and the Northwest, provided Obama with a very large share of the white vote: Vermont (68%), Maine (58%), Rhode Island (58%), Massachusetts (57%), New Hampshire (54%), Oregon (60%), Washington (59%). • In New England, the MidAtlantic, the industrial Midwest, and the West Coast, Obama clearly won the majority of the white vote. He did worse in the Mountain and Midwest Plains states. • I came to the 49.7% non-southern white vote number using exit poll data, and a weighted average based on the white population of the states. I also used a weighted average to get to the 30.2% number for the white southern vote. • Clearly, Obama did poorly among white southern voters. The difference in the voting numbers between the regions is stunning and remarkable. • One key is that Obama did practically no campaigning or ad spending in the South after the primary elections, with the notable exceptions of Florida, North Carolina, and Virginia – states which Obama won thanks to a strong African American and Hispanic vote. 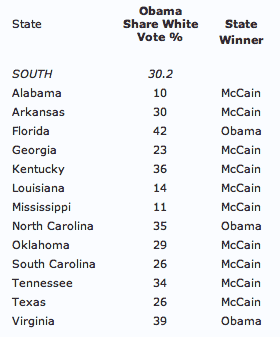 The Obama campaign basically ceded those other southern states to McCain. • The electorates in Alabama, Louisiana, and Mississippi may have been especially polarized due to some state and local elections. In Alabama and Mississippi, black candidates were running for US Senate seats against Republican incumbents. In Louisiana, black candidates were running as Democrats or independents in three congressional districts. These races, plus the Obama run, may have… I’ll use the word “energized”… white Republican voters in those states to do straight ticket voting. • White southerners are the strongest supporters of the Republican Party, so these results are not unprecedented. I have not looked at the 2004 presidential results, but Kerry may have done equally as bad, or worse, among white voters that year. Note: Text versions of the two tables are here. The tables are presented as graphics in this post because WordPress had problems rendering the pages correctly in several web browsers when I included the information in HTML tables. I’ve seen this comment over and over again on the Internet and other sources: “black people voted for Obama for the sole reason that he’s black.” But that thinking doesn’t stand-up to the evidence. As these numbers indicate, African Americans have been voting for white Democratic presidential contenders at an 88-90% rate for decades. So a large black vote for Obama was not unprecedented. Obama did get a very very high percentage of the black vote – 95%, according to exit polls – but this was to be expected no matter which Democrat was running. Current president George Bush is extremely unpopular with African Americans, due to such issues as the handling of the Katrina disaster, and the very bad economic environment for blacks. That probably caused the Republicans to lose the small sliver of black support they’ve received in the past 40-50 years. So again, any Democrat running for president – black, white, purple, green – was going to benefit from a huge share of the black vote. Having said that, there’s no doubt that having an African American to vote for president, after years of supporting white Democrat contenders, generated an overwhelming level of enthusiasm in the black community. Obama’s candidacy and campaign led to the registration of thousands of black voters, and probably a record black turnout. According to exit polls, blacks constituted 13 percent of the electorate, a 2 percentage-point gain over 2004, and the actual increase may be more than that. If black voters had been equally enthused for Gore in 2000 or Kerry in 2004, the results for those elections may have been quite different. Tomorrow, I’ll take a look at the white vote for this election. Signs of a White Backlash to the Obama Win? Most of the reporting about Barack Obama’s election victory makes it appear that there is an almost universal euphoria over this historic event. But this post at King Politics, Racist Incidences In The Aftermath of Obama’s Election, indicates signs of anger, resentment, and disgust on the part of some Americans over Obama’s win. The Joint Center for Political and Economic Studies is one of the premier research and public policy institutions – also known as “think tanks” – concern political, economic, and health issues of interest to African Americans and other people of color. The Joint Center conducted a forum right after the election which provides a number of great insights on what this means for American politics and society. The speakers include Ronald Walters, a professor in government and politics at the University of Maryland and an advisor to Jesse Jackson during his campaigns for President; and David Bositis, a senior research associate at the Joint Center and an expert on African Americans in American politics.